The Nigeria police in Abuja has arraigned some arrested members of the Islamic Movement in Nigeria members who clashed some days ago. No fewer than 28 members of the Islamic Movement in Nigeria, IMN, have been arraigned in Wuse Magistrate Court, Wuse Zone 2, Abuja, according to Leadership Newspaper. According to a report by the police, the IMN members were arrested for conspiracy and inciting public disturbances in the city. They were accused of conspiracy and public disturbances in the city of Abuja, the nation’s capital. During yesterday’s sitting, the prosecuting counsel, Barrister A. O. Orum, informed the court that the accused persons committed the offence on Monday 16th of April, 2018. 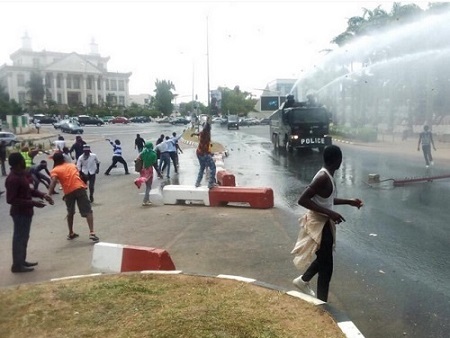 Orum said all the defendants conspired and blocked roads in the area of Maitama. “The accused persons unlawfully restrained the members of the public from having access to the road and their places of business. A conduct that disturbed and caused breach of public peace”, Orum said. The police said the accused persons offences are contrary to section 97,79,102,106,112,252,372 and 113 of Penal Code Law. The accused persons pleaded not guilty to the content of the First Information Report (FIR). However, counsel to the accused persons, Adams Ishaq, made a bail application for the 28 defendants. Ishaq assured the court that the accused persons would not interfere in the police investigation or jump bail. After listening to counsel in the matter, Chief Magistrate Aliyu Yinusa Shafa, granted bail to the accused person in the sum of N200,000 and a surety who must be a civil servant from level 8 and above. The chief magistrate also said that the accused persons and the sureties should deåßposit two recent passport photographs and also have their addresses verified by the police. The matter was adjourned to May 31, 2018 for further hearing.